The two-stroke Yamaha RX series is undoubtedly one of the most admired motorcycles in India. A fun-packed engine wrapped in a lean body gave the motorcycle a special character. While sales of the two-stroke machines have stopped in India, some motorcycles are still in proper working conditions. We have repeatedly come across neatly restored and modified iterations of the Yamaha RX-100 and the RX-135. The most recent RX-135 to catch our attention comes from Royal Customs who took a two-stroke beauty and gave it a sporty persona and hardware upgrades. Most components, as seen in the video, have been borrowed from KTM. The motorcycle gets revised ergonomics with clip-on style handlebars from the KTM RC range, but with a few modifications. While the handlebars provide a sporty stance, the bar-end mirrors give it a retro look. Surprisingly, the keyhole and the instrument console are missing from the picture. Another noticeable upgrade to the front is the upside-down telescopic forks that replace the stock, conventional units and give the motorcycle a beefier look. A monoshock suspension performs duties at the rear. The fuel tank from the original motorcycle has been retained, and the single-tone paint is complemented with contrasting lines, a 3D Yamaha logo and a chrome finished filler cap. Following the fuel tank is a custom seat. The saddle features a diamond stitched cover in black that looks subtle yet stylish. The shorter seat is meant to accommodate only the rider, and thus, you would notice that the pillion footrests have been removed from the RX-135. The saddle is mounted on a modified sub-frame that gives the motorcycle a compact look. Alloy units, which enable installation of tubeless tyres, have replaced the wire spoke wheels. The wheels are wrapped in TVS sourced rubber. The modified Yamaha RX-135 uses front suspension, swingarm and handlebar from the KTM RC range. The motorcycle rides on alloy wheels and uses disc brakes on both ends. There is no mention of changes to the engine, and thus we assume that the RX-135 uses the stock 132cc, single-cylinder, two-stroke motor that delivers 14 bhp of maximum power and 12.25 Nm of peak torque. The engine comes mated to a 4-speed gearbox. Braking department has received an upgrade and the stopping power comes from disc brake on both ends. 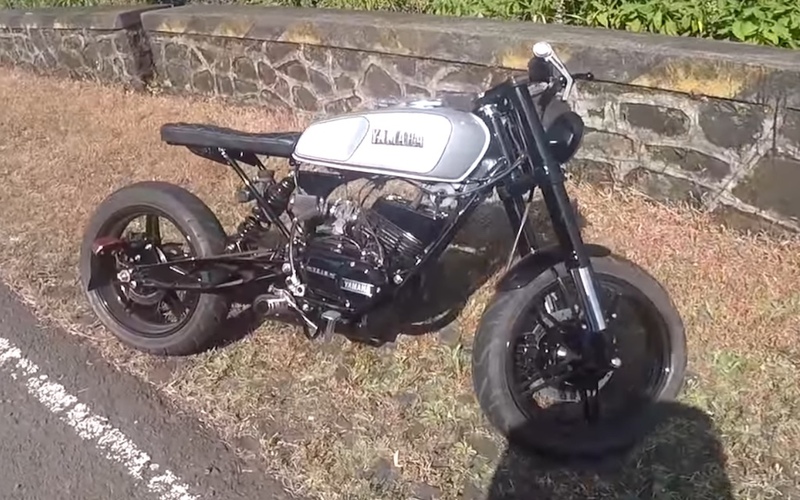 It is a neat mod-job that brings modern hardware to a sporty little machine from the past.